Shawnee’s Peyton Wilson will be in the Indians’ backfield on offense but made his mark on defense with 144 tackles on defense. PLAYER TO WATCH: Quarterback Johnny Caprella had more than 2,700 yards total offense last year as a junior. Aug. 25 at Delphos Jefferson 7 p.m.
Aug. 31 Defiance 7 p.m.
Sept. 7 at Wapakoneta 7 p.m.
Sept. 14 St Marys 7 p.m.
Sept. 21 at Van Wert 7 p.m.
Sept. 28 Ottawa-Glandorf 7 p.m.
Oct. 5 Kenton 7 p.m.
Oct. 12 at Elida 7 p.m.
Oct. 19 Bath 7 p.m.
Oct. 26 Celina 7 p.m.
To mix sports metaphors, Shawnee High School hit a home run with its hire of Jerry Cooper as its football coach. Now it’s time to get down to the business of scoring touchdowns and keeping opponents out of the end zone and trying to turn around a program that has struggled most of the last decade. It has been seven years since a Shawnee football team won more than four games and nine years since the Indians finished higher than fifth in the Western Buckeye League. But from 2004 to 2009, Shawnee tied for first in the WBL twice and tied for second three other seasons. So, Cooper sees the potential for a turnaround in Shawnee’s football fortunes. “I view Shawnee as a sleeping giant,” Cooper said. The reasons for optimism at Shawnee start with the passing game on offense and some experienced players on defense. It has four returning starters on offense and five starters back on defense from last season’s 4-6 team. Quarterback Johnny Caprella threw for 2,136 yards and 17 touchdowns last season when he was second-team All-WBL. He also rushed for 611 yards. Christian Ford, a sprinter on the track team, caught 34 passes for 586 yards last season. Shawnee’s receivers group goes five or six players deep, Cooper said. “Caprella has looked pretty incredible at quarterback. I’ve been impressed with our corps of wide receivers. I’ve been impressed with our speed,” he said. Two of the top receivers, Justin Behnke and Sheridan O’Neal, are basketball players who are new to the football program. Shawnee’s offensive line also will get an infusion of talent by adding an athlete who did not play last season. Marcus Van Meter, who was expected to start last year before a broken ankle in a scrimmage wiped out his junior season, is back. “I think he might be our best offensive lineman,” Cooper said. 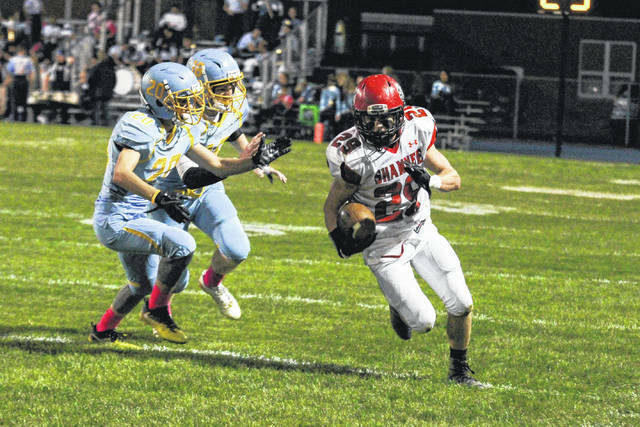 Shawnee probably will use three running backs — Peyton Wilson, Will Roberson and Austin Adams. Shawnee’s defensive leaders are Wilson and Jacob Cowan. Wilson averaged 14 tackles a game as a linebacker last season and was second-team All-WBL. He will move to safety this year. Cowan, also a linebacker, was honorable mention All-WBL last year. “I want our guys to compete in every game. We’ve got 10 games on the schedule and we want to compete in every game. I don’t want our guys to back down from any team. I want them to compete as hard as we can every week,” he said. The Indians will open the season at Delphos Jefferson on Saturday night. This entry was tagged High school football preview 2018, shawnee. Bookmark the permalink.